What The Dickens Has Happened? 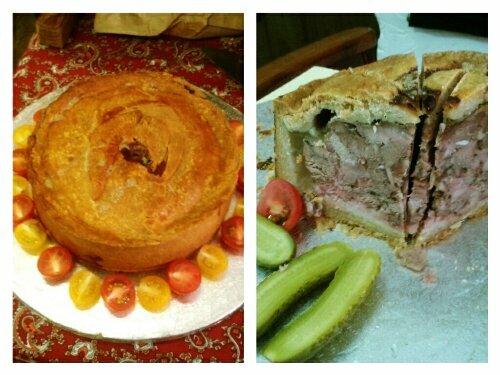 I LOVE Pork Pies! Being of Greek Cypriot origin, the humble pork pie was overlooked in my parent’s household in favour of more familiar dishes and I grew up with a deep mistrust for the ugly, brown rocks displayed on supermarket shelves and their equally unappealing description of ‘Pork Pie’. To put it bluntly, it just didn’t look or sound exciting enough to make it onto my mother’s menu during my childhood. I can see her point: why buy a pork pie when there’s homemade souvlakia, moussaka or stuffed vine leaves to devour instead? Funnily enough, we had no issues with buying, making or eating other British grub: sausage roll; fish and chips; bangers and mash; egg and chips; scones; shepherd’s pie; baked beans… I was raised on all the traditional fare, albeit with a Cypriot twist (Sunday roast with all the trimmings would be served with a side order of stuffed vine leaves) – it was just the pork pie we couldn’t bring ourselves to embrace… until now. Thanks to gentlemanly vendors What The Dickens, I’m finally a convert; a sample of their wonderfully moist Pork Pie, with its delightful hints of sage and thyme, light jelly and a perfect pastry crust, blew my mind (and my tastebuds). I bought a slice for my mum and she, too, has finally seen the light! We’ll be adding pork pies to our picnic baskets this summer… alongside our regular staples of cold chicken kebabs, hummus and greek salad. It’s taken three decades but I finally understand why the kids at school would get so excited when opening their lunchboxes to discover a neatly packaged, mini pork pie!